Samsung has launched another middle range smartphone as a welcome note into 2019, and just, as usual, Samsung launched the device with a new design and powerful features. The device went live with a new tag (#IMPOWERD). 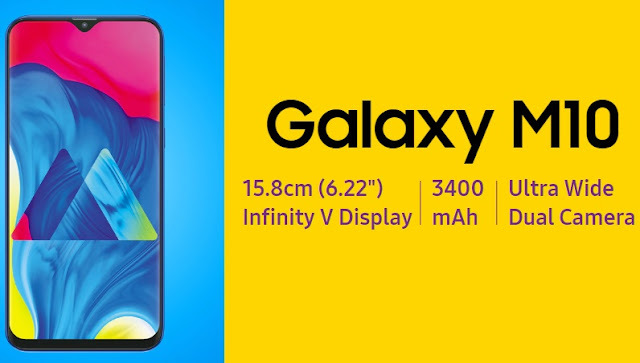 The Galaxy M10 was first launched in India and it when on sale on the 5th of February, the device comes in two variants with a difference in the price range. One with 2GB Ram 16GB internal storage while the second variants have 3GB Ram and 32GB internal storage. Both can also be expandable using MicroSD card up to 128GB. As far as the specifications are concerned, the Samsung Galaxy M10 features a 6.2-inch Infinity V display, Samsung's Exynos 7870 processor and a dual rear camera set up with 13-megapixel primary and 5-megapixel secondary sensors. It supports a 4G LTE connectivity for fast browsing. Other sensors include a Light sensor, Proximity sensor, Accelerometer. But, the device does not have a fingerprint sensor. For graphical performance that can make games run smoothly, this phone has got a Mali-T830 GPU. The design is one of the most important factors when it comes to mobiles and this phone is as slim as 7.7 mm and weighs just 163 grams.